Ken Baumann lives in Los Angeles, California. He’s worked as an actor for ten years in film, theater, and television. He currently stars in The Secret Life of the American Teenager, a series on ABC Family. His fiction, poetry, and essays have been published at VICE, Juked, HTML Giant, The New York Tyrant, Lamination Colony, and elsewhere. Baumann also runs Sator Press, a nonprofit that publishes innovative literature. Monkeybicycle: Solip begins in darkness and uncertainty – a room without end, walls plunged in pitch, a well with an unreachable opening – which reminds me of several recent books: Jesse Ball’s The Way Through Doors, Blake Butler’s Ever, Evan Lavender-Smith’s Avatar. Why do you think so many contemporary works, including your own, are invested in ideas of being lost, groping for meaning? Why such brutal and persistently detailed modern existentialism? Ken Baumann: I love those three books, firstly. Being lost and groping for meaning is as old and unchanged a feeling than anything human. The perceived popularity is an illusion, I think; there are just more people making books now. What might be unique is the avoidance of pushing against a dominant theology. We’ve got more exits in the theater. Mb: While “solip” by itself is not recognized as a word, it roots in “solipsism”, which says “knowledge of anything outside one’s own mind is unsure.” How difficult was it to write Solip from this type of philosophical stance or basis? KB: The voice came before its philosophy. The word solip feels like a tumorous, private sound, which makes sense to me. I was rereading the book in a diner—first time reading the text in its printed book form, though—and I had to stop. The voice still makes me uncomfortable. This occurred while Christopher Dorner was being burned alive and Barack Obama was giving his State of the Union speech. It’s hard not to feel this way. Mb: “You want a history? I’m shouting for XXXXX but an empty room is coming up in place. Maybe that’s it. I only move through hunger. Find some parallels while I eat the stuff on the floor. No, that too is an attitude. This is medicinal! And it’s working, honey! Do you ever worry, because of its complex and philosophical framework, that Solip might alienate some readers? KB: I don’t worry at all, but I am curious what this book will do to people. But some of the most important experiences of my life were alienating. 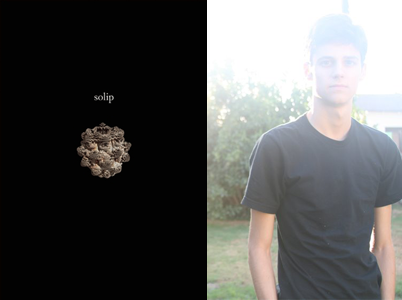 Mb: You did the cover and book design for Solip. Is this a means to control the production of your work, or how did you come to have such a close hand in the actual physical production of the novel? KB: I love designing books, and Giancarlo was generous enough to let me design the book to my exact desires. Mb: You wrote Solip and you act in The Secret Life of the American Teenager. Is it strange to have such disparate yet simultaneous artistic careers? KB: Yes and no. I like to entertain by day and disturb by night. Purchase a copy of Solip here, & read more from / about Ken Baumann here. J. A. Tyler’s novel Colony Collapse is available now. He also runs Mud Luscious Press.